Woburn, MA – In the recent past, relatively few viable residential options for seniors existed within central cities or densely developed urban areas, but that is slowly changing. Allen & Major Associates, Inc. (A&M) has been active in the creation of several of these communities throughout Mass. and N.H. and has been given a unique opportunity to impact this need by creatively finding a means to site and construct this type of project. Means have included rezoning considerations, reuse and repurposing of vacant lots, and garnering neighborhood support through inclusion. Opened in July of 2016, Brightview Canton was Brightview Senior Living’s seventh community in Massachusetts. Situated on a former sand and gravel operation and manufactured soil processing plant, the completed project contains 160 units, 95 independent living apartment homes, 40 assisted living apartment homes, and a 25-apartment neighborhood dedicated to memory and Alzheimer’s care. The project came to fruition due to the vision of the town of Canton, and its residents, who approved a proposed zoning change in 2013 to create a senior housing overlay district (SHOD). The project required a thoughtful approach to engineering and a forward-thinking development team to turn a mostly barren and impervious site into an environmentally responsible and modern development. 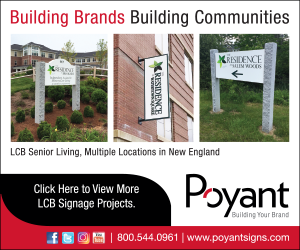 Benchmark, a provider of senior living services in the Northeast, opened Benchmark Senior Living at Woburn in September of 2016. At the time, it was the company’s 52nd community. A&M provided multidisciplined services to transform a former vacant house lot into an 87-unit assisted living and memory care facility which features a private garden and bocce court. The process also included rezoning the parcel, which was achieved by presenting a comprehensive design to the city council and by actively engaging the public with frequent neighborhood meetings. Additional challenges were how to incorporate the Benchmark Senior Living’s prototype building into the site and blend it seamlessly with the surrounding environment. The success of the design is seen in the final product, not viewed as an engineered solution, but an extension of the surrounding environment. The Residences at Silver Square located in Dover, N.H., opened in 2018. Part of the LCB Senior Living portfolio, the independent, assisted, and memory care facility occupies a portion of a 19.5± acre lot which was previously used as a college campus. The three-story, 72,360gsf building is the central feature of this mixed-use development, which includes a coffee shop and a boutique hotel. Additional pads sites for a proposed bank and medical office building are being considered to create a symbiotic community of services. The entire property is located along the Spaulding Turnpike and fronts on Silver Street in a business district, which abuts two residential districts. A&M provides multidisciplined services for this project and included extensive permitting as well as coordinated a neighborhood meeting to present the upcoming project, review the development schedule, and discuss impacts to the neighborhood such as traffic, noise, and parking. The meeting was well received and mitigated any misinformation. While the U.S. is estimating that by the year 2040 it will need about 1.8 million more senior housing units to accommodate the growing number of senior citizens, A&M continues to be on the frontline of creating viable and creative options to site opportunities and constraints. Anne Crooker is marketing director of Allen & Major. « WCSP Teams with Sea-Dar for Lab Bldg.